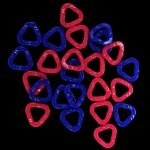 Clover Stitch Markers are great for marking the beginning and ending of pattern stitches, as well as where to increase or decrease the number of stitches. 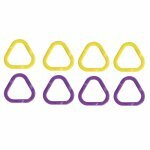 Triangle 24pc- These markers have a specific triangle shape that allows the knitting needle tips to slip in easily when passing the markers from one needle to another. S - For use with knitting needles size #0 to #4. Includes 24 pieces, 12 Red and 12 Blue. M - Sz 9-10.5 Includes 16pcs- 8 Purple and 8 Yellow.